BIOGAS Green Waste technology utilizes anaerobic digestion to convert high solid waste organics to biogas. The biogas can either be directed to a combined heat and power (CHP) system to produce electrical power or it can be cleaned/compressed and fed into the natural gas pipeline or utilized as a transportation fuel alternative. Sources for Bio-gas can be food scraps, animal manure, construction waste, agricultural waste or by products, even sludge from waste treatment facilities. Arion Energy is now providing solutions to waste with a biogas technology which utilizes anaerobic digestion to convert high solid waste organics to biogas. The biogas can either be directed to a combined heat and power (CHP) system to produce electrical power, or it can be cleaned and fed into a natural gas pipeline or utilized as a transportation fuel alternative. There are many different waste products that can be utilized as biogas sources such as food scraps, animal manure, agricultural waste or by-products, even sludge from waste treatment facilities. The biogas system is an integrated organic waste to energy solution. The modular pre-engineered design incorporates the latest in material handling and feedstock pre-processing technologies. A typical system includes multiple input channels to accept a range of feedstock and even has the ability to separate unwanted contamination. The closed system design mitigates concerns over odor. Converting these products to energy, cleans up the gases, saves space in landfills, and creates renewable energy and organic fertilizers. 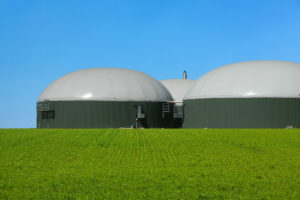 The BIOGAS-GW system is an integrated organic waste to energy solution. The modular pre-engineered design incorporates the latest in material handling and feedstock pre-processing technologies. A typical system includes multiple input channels to accept a range of feedstock and the ability to separate unwanted contamination. The closed system design mitigates concerns over odor. Converting these products to energy, cleans up the environment, reduces green house gases, saves space in land fills and creates renewable energy. Collected biogas can be used for process heating, or electrical generation: Electrical and steam generation, and transportation. A rule of thumb for electricity production is one kilowatt (kW) for every seven to ten cows. Odor and fly control:Bacteria in the digester significantly reduce odor-causing compounds. In addition, fly eggs are killed during anaerobic digestion, reducing this disease-causing pest. Pathogen control: Pathogens like E. coli, Salmonella and Cryptosporidium can’t survive the high temperature of a heated digester. Disposal:Anaerobic digestion destroys more volatile organic compounds and produces more gas than aerobic digestion does (65 percent to 75 percent of volume), resulting in less solid waste. EPA: Every year the rules of handling and disposal of these wastes are regulated more and more. There may even come a time when you may need to utilize carbon credits earned by these plants to balance your other business.